Junkyard Life’s own Ron Kidd rides shotgun on the Hot Rod Power Tour autocross with Keith Lively in his incredible 1966 Impala! I was in the right place at the right time, on Hot Rod Power Tour, when our Junkyard Life brother, Keith Lively, asked me to ride along and try to film as he navigated the cones on the road course! There wasn’t enough time to say “Heck yes,” before I was strapped tight into his all-wheel-drive, LS-powered monster, cleverly disguised as a silver ’66 Impala. Keith explained the course and off we fly. Watch as the brutal torque of this sleeper leaps off the line and pins me against the door, the seat, the dash and occasionally against Keith himself. The tires screamed in protest, but never let us get out from under ourselves. Keith’s driving skills are amazing. Despite being all-wheel-drive, it’s still a full-size car that thinks it is a Porsche. The centrifugal force smashed me against the door so hard that the window crank cut my leg. So, I was beaten up and bleeding a bit? It was very much worth it! Thanks Keith! Who needs a Go-Pro Camera when you have me? 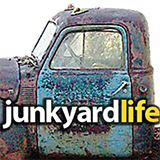 Know of a junkyard we need to visit or want to send me info about a car or junkyard? Send emails to Ron at Kidd403@bellsouth.net or Jody at junkyardbull@gmail.com.